My first post for 2016 had to be a special one. New Year’s eve for me and Sahil is mostly at home. We either host a family dinner or a house party with close friends. Once it’s closer to 11pm, we step out and drive around to catch a glimpse of the breath taking fireworks which has tourists from world over flock to Dubai. This year however we were in mood for something outdoorsy. Josh, my colleague suggested we join him and my other work mates for a camping trip. On a side note, Josh is also a founding member and lead vocalist / guitarist for the popular Dubai band Candy Flippers. Go follow them because they are aaaahhhmaazingggg! We settled for a BBQ themed camping trip in Ras Al Khaimah desert. The build up to the new year’s eve was amazing as well. After endless banter on a common Whatsapp group and 4 trips to the hypermarket we were well stocked. It was fun going to the mall looking for camping supplies since this was my first camping experience in the desert. It was magical to say the least! I was in-charge of catering to the vegetarians in the group. I decided to go for Paneer Shashlik, Veggie burgers with caramelised onions, roast potato pouches and grilled assorted vegetables. Here I am sharing the recipe for Paneer Shashlik or Paneer Tikka. In a mixing bowl, whisk greek yoghurt and add tikka masala, ginger garlic paste, coriander powder, garam masala, cumin powder, turmeric, chaat masala and dried mint and mix well. 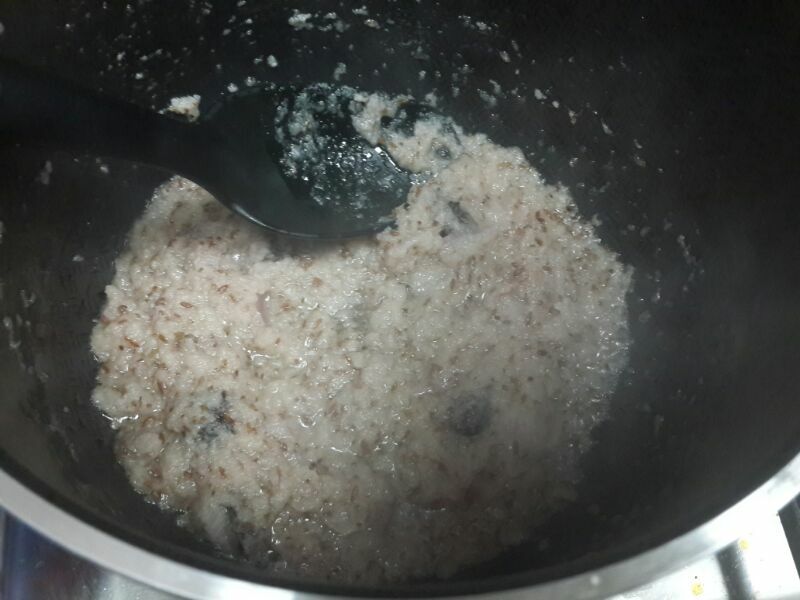 Heat oil in a pan and add carrom seeds. Once they splutter, add kasundi paste and red chilly powder. Let it cook for a few seconds and add chickpea flour. Keep stirring continuously on low heat until the mixture gets some color. Take it off the heat and pour over the yogurt mix. 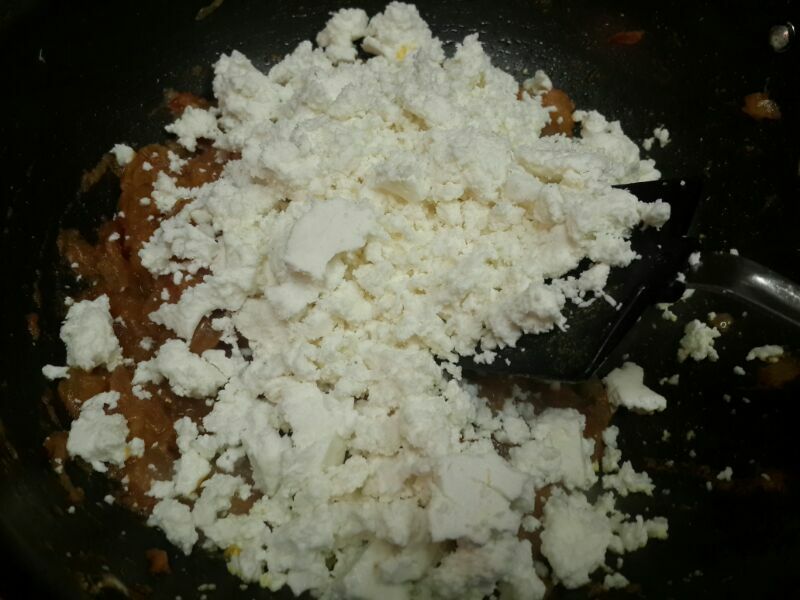 Blend the mixture lightly and add the paneer, onions and peppers and coat it evenly with the mixture. Refrigerate for at least 2 hours. Once you are ready to cook, you can start assembling the paneer tikka on a skewer. If you are using the bamboo ones, make sure you soak them in cold water beforehand so that they do not burn when placed on the hot BBQ. I decided to go for the stainless steel BBQ skewers given they seemed sturdy and could make more servings of the paneer tikka in one go. Also they last you many BBQ trips, I got mine for AED 8 for a pair of 4 from Carrerfour. Now let’s get on to the assembly part, you begin by oiling the skewer well. Add one cube of red pepper followed by one cube of yellow pepper, then one cube of capsicum and lastly one cube of onion and one cube of paneer. Follow this for step for the rest of the mixture on hand. Place it on the hot BBQ, it takes usually 15 minutes for the skewers to get cooked. Keep turning the paneer skewers after every few minutes so that all sides get some color evenly. Once it is evenly browned, remove the paneer and veggies from the skewers and serve with spicy coriander mint chutney. Unfortunately I do not have good pictures for the dish however this did taste good and the recipe will be a bookmark for any other BBQ parties I host. I had used the same recipe before, here is a better picture I have from that BBQ party. However I did make some changes to the recipe and this post includes my revised version. Do try it sometime and let me know if you like it! Somewhere in the middle of a desert, cooking on the BBQ, under the stars, next to the bonfire and tents set up, listening to some guitar and have an ensemble croon to melodies. Too much was happening around however I felt a sense of calm and happiness. This is how we welcomed 2016 and hope this be the best year yet for us. Wishing everyone here as well a great 2016! A wall of silence on the blog! While I may have not blogged for the last 2 weeks, a lot of cooking happened. Past few weeks have been all about cooking for family. Late Holi wishes to everyone out here, this Holi we celebrated with our extended families, lots of food, laughter and a sense of belonging. Gujiyas relished from Old Delhi sweet shop. One of the best festive celebrations we have had since we embraced our expat lives in Dubai. These days I’m trying to follow a high protein diet. Being a vegetarian, paneer or cottage cheese is the most common substitution for meat in Indian sub-continent. It is also an excellent source of calcium. If I’m busy, I just buy a block of cheese from Lulu’s or Bikanerwala or else make it at home. It is a staple in my pantry. While I love my Paneer with vegetables and in Makhni gravy, sometimes all you need is a no-fuss and easy to make dish. 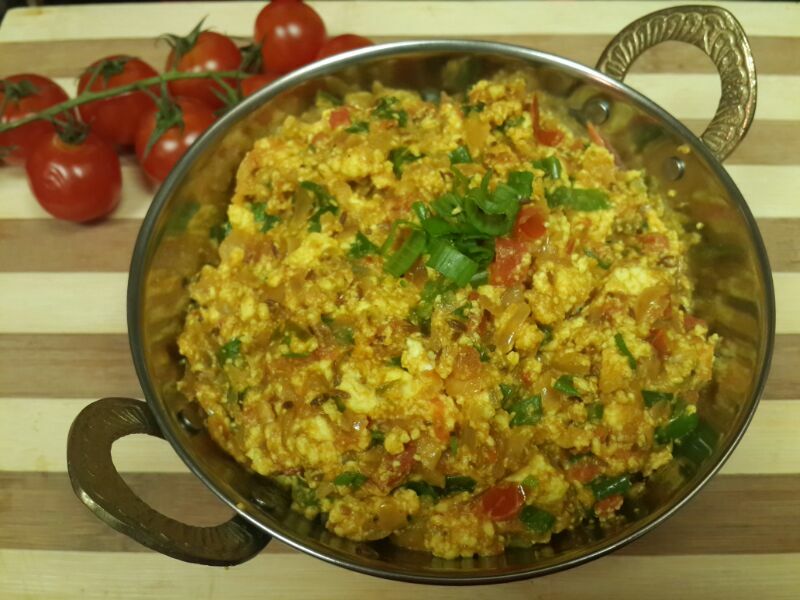 On days like this, I have this recipe of Paneer Bhurji handy. 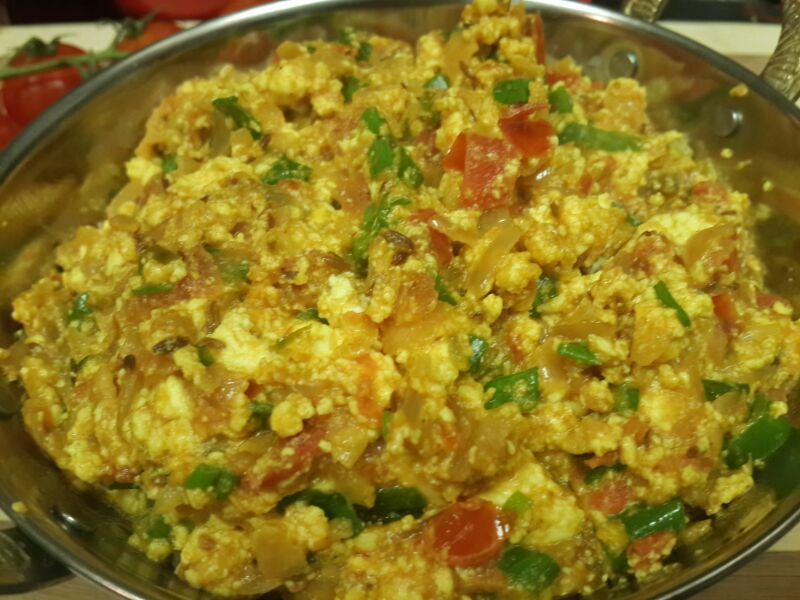 A bhurji is simply means a scramble. On work day mornings, it gets ready in a jiffy including the prep and it means I can brown bag my lunch and not spend my molaah on take-aways. In a wok heat some oil, add cumin seeds. Let them sizzle and add green chillies and ginger garlic paste. Add onions after a minute and cook them until they are translucent. 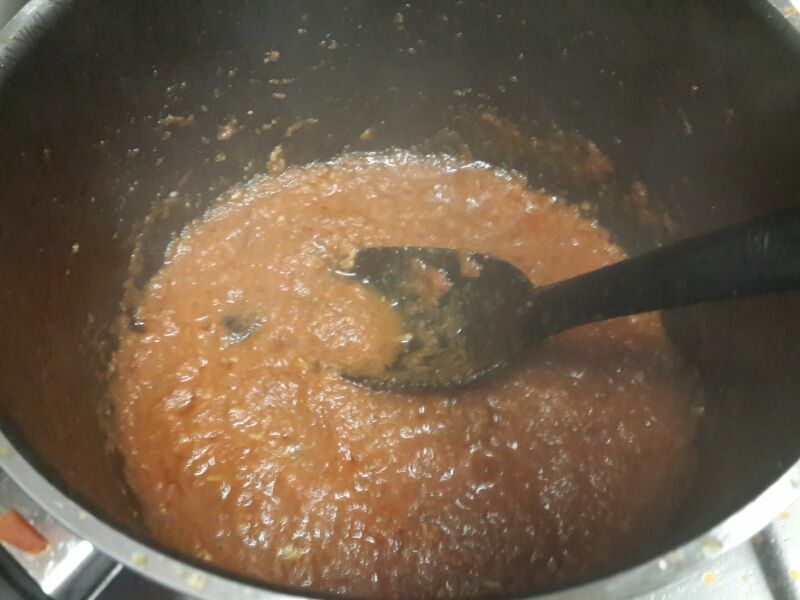 Add tomatoes, tomato paste and the dry spices and cook them until the mixture leaves a ring of oil on the sides.You can also add green peas and capsicum to the mixture. With your hand just crumble the paneer lightly or you could use a box grater. 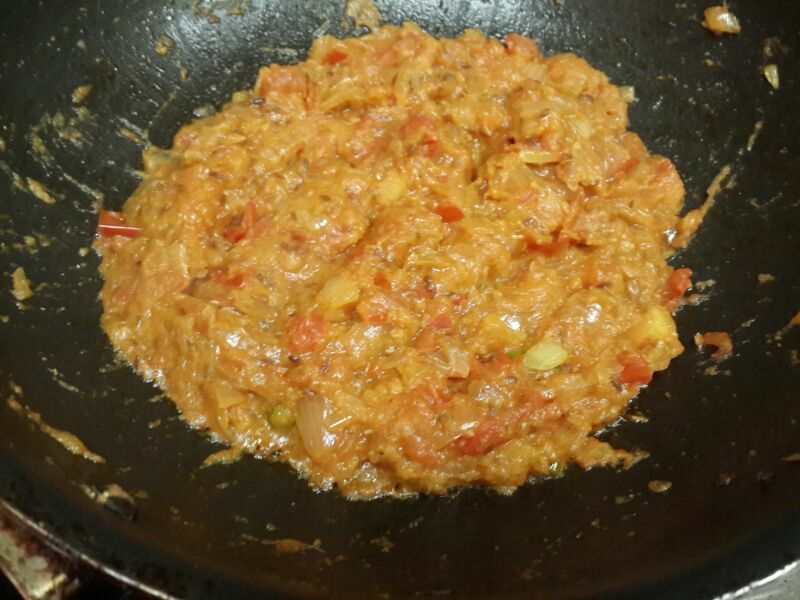 Blend the paneer well with the onion-tomato mixture and cook for a while until the mixture is not quite moist. 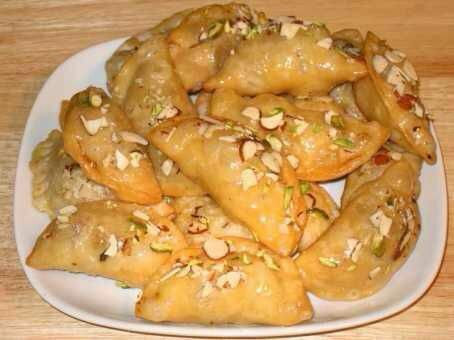 Serve with fluffy phulkas or toasted bread with butter. Next post I will bring you stories from my meeting with the MasterChef himself, Sanjeev Kapoor and the euphoria that followed after the same. Also my experience of meeting the Curry Queen – Camellia Panjabi, such a lovely lady. Me and Sahil had a really candid and heart warming conversation about differences in coastal cuisines and misrepresentation of Indian cuisine internationally on many instances. How we asked her to please write a new cook book and much more! Sundays in Punjabi households usually mean either two things. One the mums or grandmas are off duty and aren’t going to feed you at your beck and call and just make one pot wonders, or they do have a crowd to entertain and would be seen slogging a day before the feast is to be served. Lunch used to one pot meals or there comes any curry with basic pilaf rice or steamed rice. My grandma used to make Rajma / Samhar / Kadhi lovingly for us. She used to serve this with Cucumber Mint Raita, onions marinated in vinegar and salt and mango pickle. Sunday lunch used to be a long affair with conversations drifting around family gossip, plans for the week to come, silly family jokes and general chit chat. Such a heavy meal used to ensure the kids retiring for an afternoon siesta and the ladies after patting them to sleep enjoying long tea sessions. 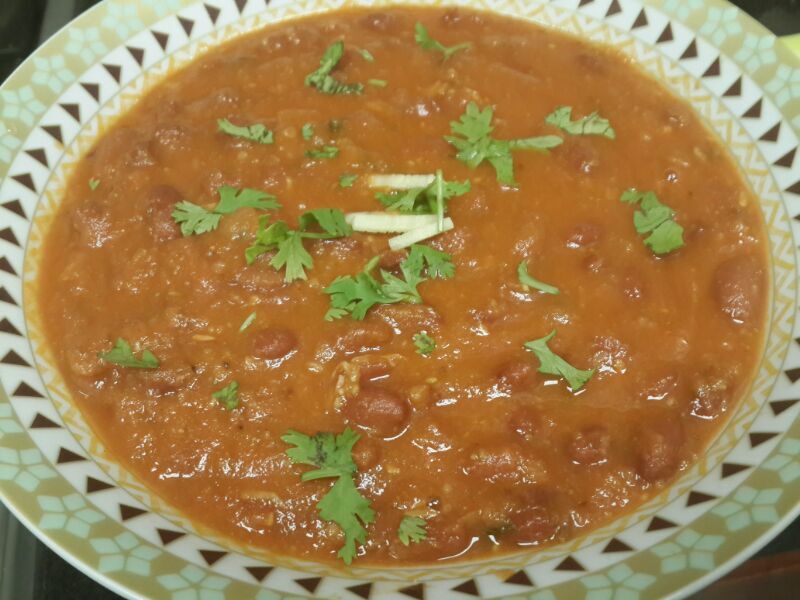 This recipe is inspired by the way Rajma used to be made at my family house. I usually include legumes and beans in my diet. Red kidney beans being an excellent source of fiber and are recommended to individuals with high cholesterol and diabetics since they help regulate the blood sugar level. It also good source for keeping iron deficiency at bay and being a vegetarian, it helps me up my protein intake as well. Soak the red kidney beans overnight. In the morning, add some salt, turmeric powder, cloves, bay leaves and black cardamom to soaked kidney beans with 5-6 cups of water and pressure cook until it has 5 whistles. Do not discard the stock once they have been cooked. If you want to save yourself the trouble of remembering to do this the night before, just grab two cans of red kidney beans and you will be are sorted! In a deep sauce pot, heat oil and add slit green chillies. Deseed the chillies if you do not want the heat, I prefer to have them as is, it gives a nice kick to the gravy. 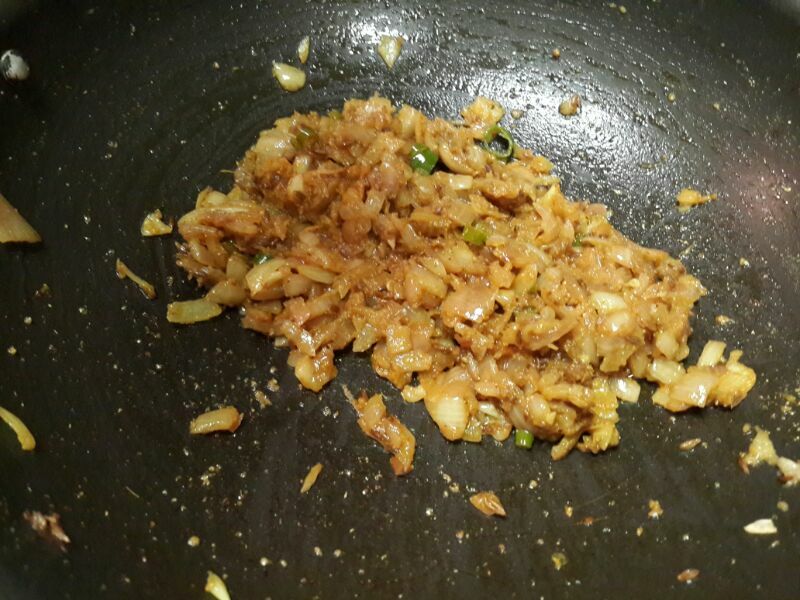 Once the green chillies sizzle, add the ginger and garlic paste and cook them for a bit. Add the grated onions and cook them until they acquire a nice light brown color. Add the tomato puree and keep cooking the mixture for 8-10 minutes until it forms a ring of oil on the sides. Mid way while cooking the onion tomato mixture add the tomato paste, coriander powder, salt, kashmiri chill powder, cumin powder, half of the garam masala and half of the rajma masala and blend the spices well. 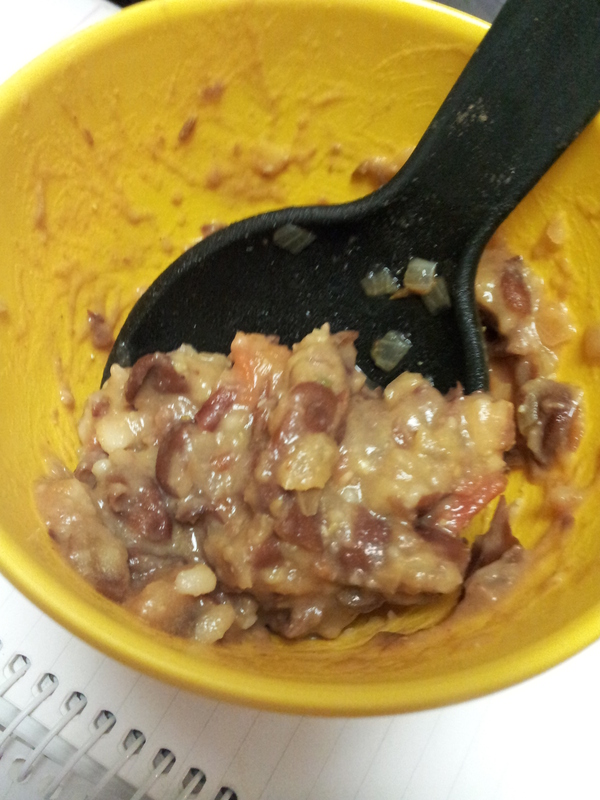 Add the cooked red kidney beans to the mixture and mix them well. Pay attention not to squish the kidney beans. 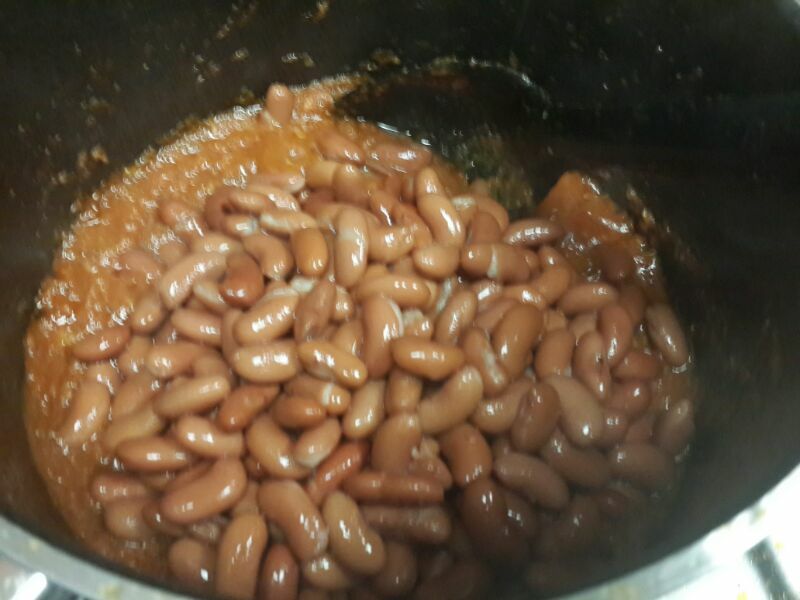 Add the stock from the pressure cooked rajma as per the consistency you wish and cook with a lid on. If you have used canned beans then you can use a cubes of vegetable stock. After 3-4 minutes, mix well and add the remaining rajma masala and gram masala. Add kasuri methi, it makes the gravy quite fragrant. You may choose to skip the same. At this stage I usually take a ladle full of kidney beans in a bowl and mash them with a back of spoon and add the mashed beans to the pot. This is a old trick my grandma uses to get a smooth consistency. This is how the mixture would look. 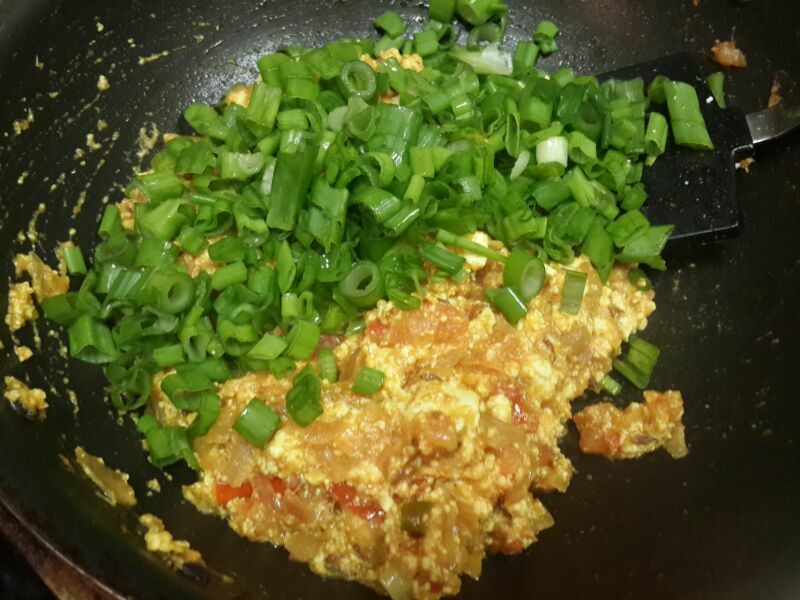 Cook for another 10 minutes on medium heat and keep stirring at regular intervals. Add ginger juliennes and turn off the heat. Voila! Serve hot with steamed rice and side of pickled onions and masala papad.